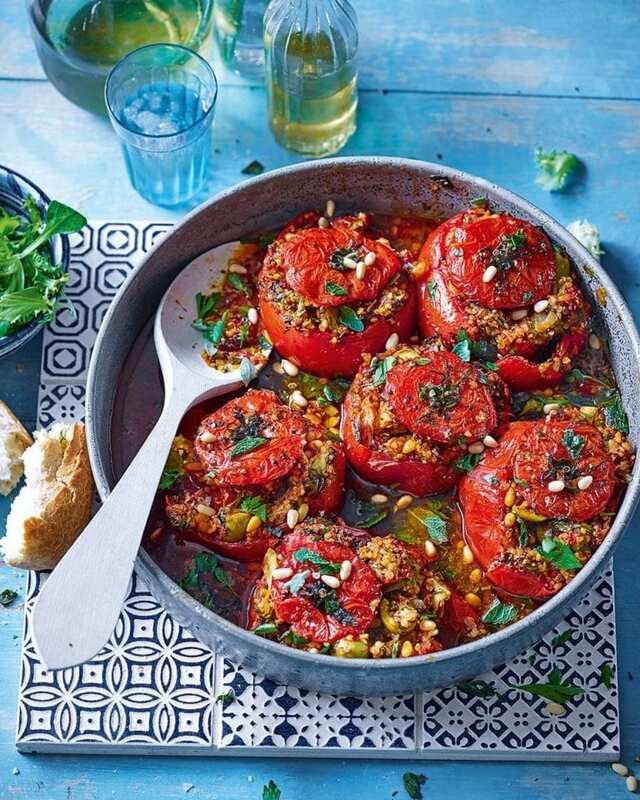 Stuffed baked tomatoes are an impressive, and incredibly tasty, vegetarian main. We’ve used a combination of artichokes, pine nuts, herbs and rose harissa to create a dish that’s bursting with flavours of the Mediterranean. Heat the oven to 190°C/170°C fan/gas 5. In a saucepan, bring the stock up to the boil, then tip in the mixed quinoa/bulgur wheat, a glug of oil, the spices, salt and freshly ground black pepper. Bring back up to a fast simmer and cook until tender and all the liquid is absorbed (top up with a little more boiling water if needed). Take off the heat. Heat a glug of olive oil in a frying pan and cook the onion for 5 minutes until beginning to soften. Add the garlic and continue cooking for 2 minutes. Cut a 2cm slice off the top of each beef tomato (set aside), then use a teaspoon to scoop out the pulp inside. Put the pulp in a sieve set over a bowl to drain away any excess water. Roughly chop what’s left in the sieve and add to the pan with the onion and garlic. Increase the heat and continue cooking until the mixture has reduced and thickened (about 5-10 minutes). Add the sun-dried tomatoes, chopped olives, chopped artichoke hearts, harissa and most of the pine nuts and chopped herbs to the pan. Stir to combine. Tip in the cooked grains and stir again. Put the hollowed-out beef tomatoes in a lightly oiled baking dish and fill each one with the grain/veg mixture. Put the tomato tops back on, then pour over the wine and dot the butter over the tomatoes. Bake for 20-25 minutes, basting half way through with the cooking juices, until the tomatoes are tender. Garnish with the remaining pine nuts and herbs, then serve with a crisp mixed salad and crusty bread for mopping. Complete the recipe, then cool, cover and chill for up to 3 days. Reheat the stuffed tomatoes until piping hot all the way through. Zesty sauvignon blanc; a fruity southern French pays d’oc is best of all.